If you’re new to the Culture Map tool, check out our introductory blog post here. 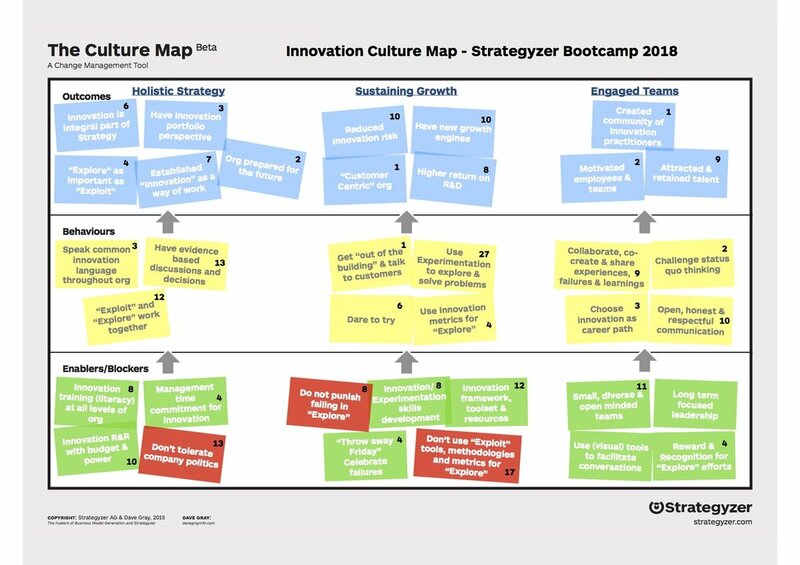 At our Bootcamp in June I challenged our participants to sketch out an ideal innovation culture in groups of 2 in a 15 minute exercise. It was fascinating to watch each group find a shared language for the outcomes, behaviours, enablers and blockers they felt were important for nurturing a culture of innovation. Holistic Strategy: In this stream, participants noted that the future business (explore) has to be just as important as the existing business (exploit). Companies that truly innovate manage a portfolio of existing AND new businesses. Leadership also has to make a real commitment to innovation by contributing time, resources, training and power. Sustaining Growth: Here participants mapped out the behaviours, enablers and blockers to perform growth innovation inside a company. Notice how the stickies show actions that encourage experimentation and potential failure, customer-centric activities (e.g. get out of the building), and metrics that focus on exploring new value propositions and business models. Engaged Teams: A team of innovation practitioners needs to be motivated and nurtured to do great work. In fact, they should be encouraged to choose innovation as a career path, not as career suicide. These cross-functional teams have to be small, diverse, and open-minded. They need to challenge status-quo thinking that can bleed in from the existing business. Innovation teams also need to properly rewarded for their efforts and success.